TAMRON 70 – 300 Lens test driver, by G8GKU. 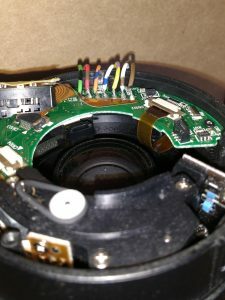 This article presents information relating to the interfacing of a TAMRON lens to an Arduino Nano. Having acquired a well-used TAMRON 70-300 mm A.F. zoom lens, ( Cannon mount ) from a photographer friend, along with the information that the lens now only occasionally operates properly after many years of faultless service, it was decided to attempt to communicate with the lens, as a technical challenge. Important. Before proceeding further it has to be made 100% clear that the information presented here relates to a written-off lens with zero financial value. Any use of this project and related information should only be undertaken with the full understanding that interfacing to a lens of financial value may result in financial loss and / or damage to the lens. Be warned. General Information. The lens is of the older technology where the auto focus mechanism is driven by a miniature electric motor. A reader may be tempted to immediately connect the lens to the interface electronics and then to run the code, however, it is strongly suggested the notes below are read first. If a fast start is needed then as a very minimum read the paragraphs relating to the wiring to the lens and connect the lens to the electronics only via the recommended resistors as detailed below and ensure the correct voltages are available before running the code. Information gleaned via the internet indicated the lens communicates with the host camera via a serial protocol, in this case a three wire SPI bus. Lens electrical connections. Physical electrical connections between the lens and camera are via contacts arranged in semi-circular layout on the camera-facing mounting ring of the lens. The lens used has 7 physical connector pads, others may differ. Visually the external lens contacts are distinguished by having a double-width pad placed second from one end of the group, the adjacent single pad is taken as ‘first’ pad in this project. N.B. in this interface project the Arduino Nano will provide the signals relating to the ‘ camera ‘ in the list above. Nominally the lens motor power is supplied to a dedicated lens connector and is separate from the Logic 5v Vcc. The author supplies the 5v motor supply from a bench power supply set to 5v. It may be possible to use the same 5v as used for the Vcc from the Nano, additional capacitors on the 5v line would be suggested. However, the author has not tested this, only the bench supply being used. To initially test the overall project, the code will read back the Zoom position without the motor power being supplied, as only the Vcc 5v is needed. This allows a ” gentle start ” to the experiment before the motor 5v is applied for tests requiring it. It must be noted that the easiest connection method which is also 100% non invasive to the lens itself, is to use a lens adapter or extender unit, which carries duplicated pins on both sides, fitting between the lens and the camera body. If available, such an adapter could have the interface wires fitted in an invasive fashion and as such may be used as a connection platform for the lens interface, thereby not making intrusive change to the lens. screwdriver is recommended, use a firm grip. After dismantling it will be found that the pads on the outside of the lens are part of a small plastic mounting assembly, held in place by two further small screws, removal of these screws releases the pad assembly. To prevent any chance of the contact pads of the released contact assembly touching other electrical connections, the pad unit was covered with removable insulating tape. The pad assembly is electrically connected to the internal curved printed circuit board ( PCB ) by means of a short flexible multi-track PCB. If the conductors of the above short flexible PCB are inspected it will be seen that the first external pad and the double-size pad are swapped in sequence by the flexible PCB as it terminates to the inner PCB. Image above shows thin wires soldered to inner curved PCB. To make the physical wiring interface to the lens, seven thin flexible multi-strand wires were soldered to the inside destination end of the flexible PCB. Each wire being about 50 cm in length. The lens end of each wire being trimmed back to about 1 mm after solder tinning, facilitating small joints. Delicate and careful soldering is required, use a different colour for each wire if possible. resistors are used to allow the lens and the Arduino Nano to interlink and operate without problems which may be caused by code or other errors, also under normal operation. Do **NOT** directly connect the Nano pins, via wires, to the LENS electronics. Please see and use the wiring diagram, as below, dia 1. A summary of the wiring diagram is provided below for convenience, resistors in the MOSI and MISO lines are strongly recommended. The resistors are soldered to the Nano end of the interface wires and heat-shrink insulated. …… connect Nano MOSI, pin D11, via a 470 Ohm resistor ( 390R to 1k suitable ) to the Dout lens pad. …… connect Nano MISO, pin D12, via a 470 Ohm resistor ( 390R to 1k suitable ) to the Din lens pad. Please understand, without resistors in series with pins D11 and D12, it is possible that damage may or will be inflicted upon the lens electronics or the Nano or both if errors occur. ….. connect Nano D13, logic OUTPUT, Clock signal source, via a 1k resistor to the lens Data Clock input. The two resistors for Nano pins D13 and D8 are mandatory. clock signal whilst it is busy, typically post receiving a command. Connecting the clock drive signal from the Nano to the lens via a resistor, will allow the Nano to drive the clock signal to the lens from Nano pin D13, without either Nano or lens suffering damage when or if the two ends are at opposite logic states, i.e. when the lens holds down the clock signal. 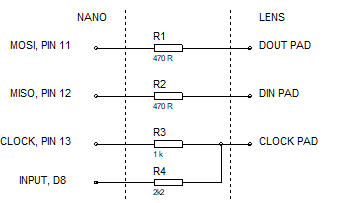 The 2k2 resistor allows the state of the *lens* clock signal( logic 1 or 0 ) to be read back into the Nano via pin D8. There is no intention in the code to provide anything close to a fully specified interface to the lens. Code provided demonstrates how the interface protocol functions and provides an example which works in conjunction with the lens used by the author. Functions provided will read the position of the zoom function and will drive the auto focus motor between close in and far out focus, also the Iris can be made to ‘ blink ‘. Other functions and the related specific command codes are easily found via the internet and interested persons are invited to experiment with the code as they need.